Catbus: Nekobasu Transports You Out of the World? Catbus- If you have watched My Neighbor Totoro (1988) once, you must have had the desire to ride on that huge cat bus who grin like a Cheshire. He doesn’t work on the schedule, so you have to have a good reason to call and ride on him. He is more like a taxi in that sense. Where you would go with Catbus, ask your heart. The Catbus – Nekobasu is a character in the Studio Ghibli film My Neighbor Totoro directed by Hayao Miyazaki. The Catbus is a large creature who serves as a bus with a hollow body and the interior is coated with soft comfortable fur. Instead of tires, he is equipped with twelve legs like a centipede. The bushy tail and lightning eyes make him look unique and something like… a ghost. It really is a cat ghost, which turned into a bus. He brings ghosts to the Pure Paradise working as a hease. A window stretches to become a door when a passenger would like to board it to travel. The catbus runs, flies, bounces and hops across forests and lakes to reach it destination while making whole rice fields sway in its wake. The catbus can take you anywhere even when passenger herself doesn’t really know how to get there. Like Satsuki, big sister wished to find out where her little sister, Mei is. You can set the destination not just place, but also a person can be a destination. If Catbus is a hease, what Totoro does? Totoro is a guide to walk ghosts through to the Catbus… Considering the fact that not everybody can see Totoro, he has some power or he must come from another world. Or he can live only in minds which can imagine what they can’t see with their physical eyes. Totoro once came at night and had a seed-planting party with Satsuki and Mei, seeds grow real fast to huge trees that night. Next morning, there are no trees, but there surely are seedlings in the soil. Totoro must be a catalyst to show how far imagination can go and let them have a glimpse of another world. This rare, velvet worm’s name is Totoro. ~Ivo de Sena Oliveira, et al. 2013. A new species of Eoperipatus (Onychophora) from Vietnam reveals novel morphological characters for the South-East Asian Peripatidae. Zoologischer Anzeiger 252 (4): 495–510. Eoperipatus Totoro has taken its time to be widely recognized and appreciated. First discovered in November of 2007 by researchers from the Lomonosov Moscow State University and the Vietnam-Russia Tropical Centre, the secretive worm wasn’t formally described in scientific literature until June of 2013. There’s a 13 min. short film titled Mei and Kittenbus released in 2003. This is the sequence of the film My Neighbor Totoro, which you can watch only at Ghibli Museum in Mitaka, Tokyo. The Catbus is hugely featured in the film. The story is about Mei meets the offsprings of the original catbus, which is simply named Konekobasu (Kitten Bus). Kittenbus is just large enough to fit Mei inside, and can only stir up dust devils. 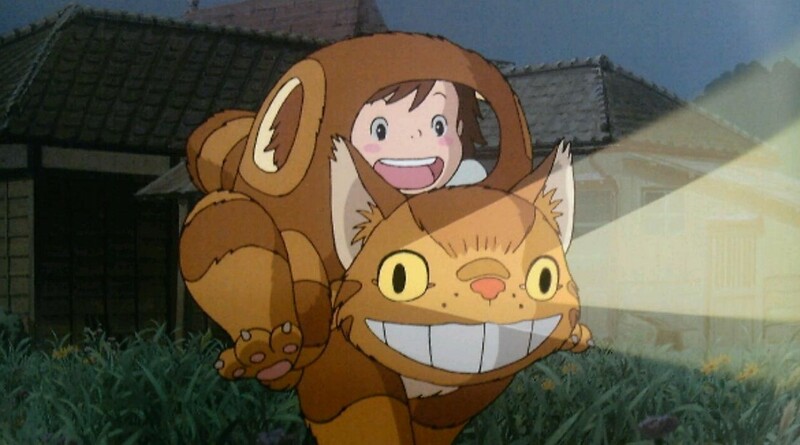 They fly into the forest with many other cat-based vehicles, including different types of cat buses and cat trains, which are carrying Totoro and many other forest spirits to a cat liner, which is depicted as an ancient cat. Mei meets O-Totoro and befriends the cat liner, before returning in the kittenbus to her home. « Black Cat Jiji in “Kiki’s Delivery Service”: Why He Lost his Voice?